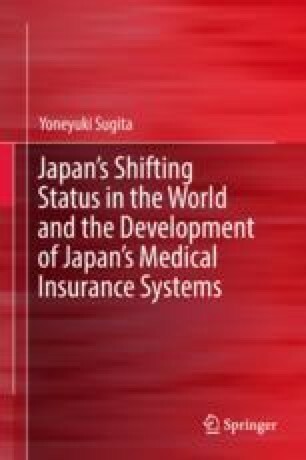 This chapter addresses two research questions: (1) Why did Japanese Health Insurance, Japan’s first social insurance, come into being in the 1920s? and (2) what were the implications of this development? My hypotheses are that (A) Japan’s status in the world after World War I affected Japan’s domestic labor policy; and (B) the Japanese government sought to establish a more organized healthcare system through a health insurance corporatist framework consisting of the government as a coordinator, big business, and the Japan Medical Association as a specialized interest group. This chapter explains the relationship between the government and major corporations, emphasizing the role that the corporate health insurance associations play in the Health Insurance corporatist system. Philippe C. Schmitter, one of the most important corporatism theorists, claimed that “a system of interest representation … [is] recognized or licensed (if not created) by the state and granted a deliberate representational monopoly within its respective category in exchange for observing certain controls on its selection of leaders and articulation of demands and supports.” Schmitter (January 1974). Kenko Hoken Kumiai Rengokai [National Federation of Health Insurance Societies]. (2008). Kenko hoken kumiai ron (iryo seisaku to kempo kumiai no yakuwari) no kochiku ni kansuru chosa kenkyu hokokusho (gaiyoban) [A research report on the establishment of Health Insurance Associations (Medical policies and the roles of Health Insurance associations) (outline version)] (2). http://www.kenporen.com/include/outline/pdf/chosa21_01.pdf. Accessed May 5, 2018. Nippon Research Institute. Nenkan so rodo jikan [Total annual working hours] http://www.research-soken.or.jp/reports/digit_arch/labor02.html. Accessed May 5, 2018. Rinji Sangyo Chosakai [Extraordinary Commission to Investigate Industry]. Dai 1kai sokai gijiroku [The minutes of the first general meeting]. (1920, March 13). Ajia Rekishi Shiryo Senta [Japan Center for Asian Historical Records, National Archives of Japan]. A05021047200. https://www.digital.archives.go.jp/das/image/F0000000000000068623. Accessed May 5, 2018. Rinji Sangyo Chosakai. Dai 3kai kanjikai gijiroku [The minutes of the third executive meeting]. (1920, March 26). Ajia Rekishi Shiryo Senta [Japan Center for Asian Historical Records, National Archives of Japan]. A05021047600. https://www.digital.archives.go.jp/das/image/F0000000000000068625. Accessed May 5, 2018.